Nick is not alone. “Studies show 70% of adults will suffer from arthritis at some point in their lives,” says Emil DiIorio, M.D., Founder and Medical Director of Coordinated Health. 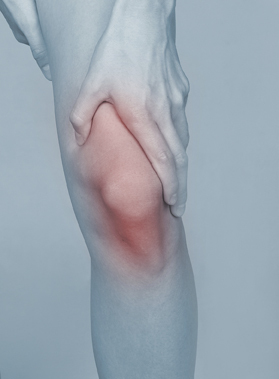 “Osteoarthritis, or OA, is the most common form of arthritis. It’s marked by a gradual breakdown of cartilage in the joints which leads to pain, stiffness, and swelling. The earlier stages of OA often begin before middle age.” Osteoarthritis of the knee is a degeneration of the smooth surface covering the ends of the femur and tibia, the bones that form the knee joint. This painful condition is one of the five leading causes of disability among men and women, according to the American Academy of Orthopaedic Surgeons. “The primary reasons we treat OA of the knee are to reduce pain, allow for better movement and function, and improve the quality of our patients’ lives,” says Dr. DiIorio. Whether or not you need surgery, physical therapy is the key to helping you resume your normal function and get back to living a pain-free life. Osteoarthritis of the knee often has an earlier onset in knees that have experienced trauma, infection, or injury. Risk factors for OA of the knee include heredity, obesity, advancing age, gender (more women than men suffer from OA of the knee), previous injury, repetitive stress injuries, and participation in high-impact sports. Your doctor can diagnose OA of the knee by obtaining a complete medical history and x-rays. “Osteoarthritis is classified into four grades, with Grade 1 being the least severe, and Grade IV, which is the most severe form of the disease,” explains Carl Weiss Jr, M.D., an orthopedic surgeon at Coordinated Health who performed three of Nick’s surgeries. Cortisone injections: Cortisone is a powerful anti-inflammatory that is injected directly into the knee joint. Injections are done to control inflammation and are most often done in conjunction with physical therapy (PT). Injections are typically done at least three months apart. Repeating cortisone injections too frequently can actually speed up the degenerative process. Relief can last several months to several years depending on the severity of your OA. Oral Anti-inflammatories: These are often used in conjunction with PT and cortisone injections. Viscosupplementation: A series of injections into the knee designed to lubricate the joint surfaces by replacing the synovial fluid that is normally found in the knee joint. As OA develops, the knee gets less lubrication and is more likely to be injured from the stress and strain of normal daily activities. Once the series is complete, it can take up to six weeks to begin feeling relief from symptoms. Relief can last for a period of weeks, months, or even years depending on the severity of your OA. Following surgery, some patients return to work several days later. “If your job requires a lot of bending, kneeling, squatting, or climbing, your return to work will take a little longer than someone with a sedentary job,” notes Dr. Weiss. Whether or not you need surgery, physical therapy (PT) is the key to helping you resume your normal function and get back to living a pain-free life. Maureen Sangiorgio is an award-winning consumer health writer based in Macungie, PA.
Amanda Boyce, ATC, CSCS, of Coordinated Health contributed to this article. Coordinated Health is an integrated musculoskeletal healthcare delivery network with six locations in Allentown, Bethlehem, Easton, Brodheadsville and East Stroudsburg. Look for The Art of Medicine television show premiering Saturdays at 5:00 pm and Mondays at 11:30 am in March on Channel 69.